Ha Giang is the final frontier in northern Vietnam. It is said to have the most spectacular scenery in all of Vietnam. A place of absolute relaxation where you can observe nature, limestone pinnacles and granite outcrops. Ha Giang is also a hidden part of the world where many ethnic groups such as H’Mong, Lolo still maintain their unique way of living which is a remarkable highlight to absorb and experience. Why Is Ha Giang The Best Spot For Adventure Tourism In Vietnam? Ha Giang province goes as far as the northern most tip of the border, where Vietnam meets China. The adventure involves a lot of time on the road travelling from Hanoi through the Dong Van karst plateau. However considering the scenery, this is an amazing part of the journey. To enrich the discovery, the adventure is developed with a deep local approach. Travellers will stay at selected local houses, have a home hosted meal and take off the beaten track trekking to get up close to the community. 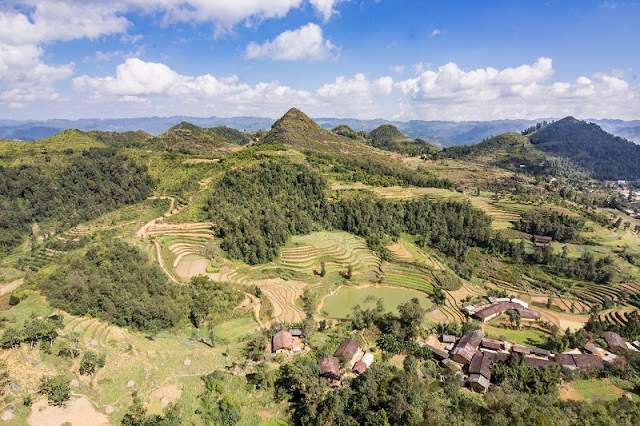 Visit Ha Giang at this time, in addition to trekking activities in extremely favorable weather conditions, explore the wildness of the terraced fields before entering the rice cultivation season, you can also enjoy the dish outstanding features of the Northern Mountains. Especially if your journey takes place around May, you can witness the Khau Vai love market festival, a big festival of Meo Vac district, bringing the cultural essence of ethnic minority groups where here.